If you are a person who loves adventure, you must have heard about Tandem Kayaks, right? These Kayaks are often known as only TANDESMS and these are for the people who prefer to be social in this solo world. Sharing the paddling session with someone special is always what we want. And so, we are here to present you with the Best Tandem Kayak of this 2018 that are leading the market along with the customer’s heart. 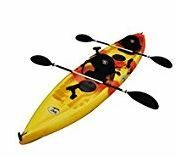 This review on best Tandem Kayaks will not only provide the features, positive and negative aspects of the top-notch Kayaks these days, but also will come up with the ideal Kayak as per your requirements providing the details. Tandem Kayaks are the ultimate choice if you really want to enjoy your outdoor sports. 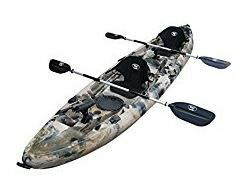 And if you want to enjoy the fishing period with your beloved one then Brooklyn Kayak Company’s BKC UH-TK219 12 ft. tandem kayak will be the ideal selection. For having a 12 ft. length, this Kayak can hold 2-3 persons easily. That makes this kayak a multi-person kayak or it can also be addressed as family-person kayak! 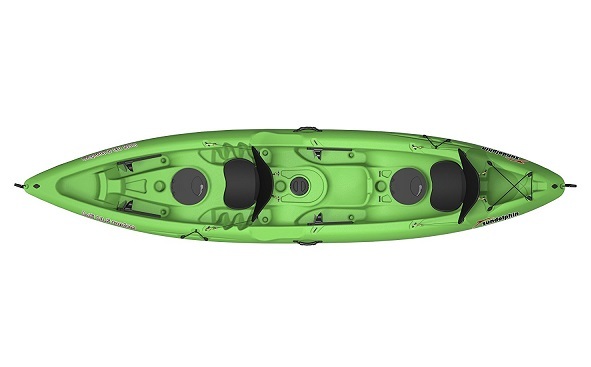 This Kayak has 4 flush mount and 2 adjustable rod holder which makes 6 total rod holders. The 2 adjustable rod holders are great for keeping various fishing lines in water. The two Kayak seats are luxurious and this kayak has rear pouches for proper ease. Not only for family fishing, solo exploring and fishing is also attention-grabbing in this Brooklyn Kayak. 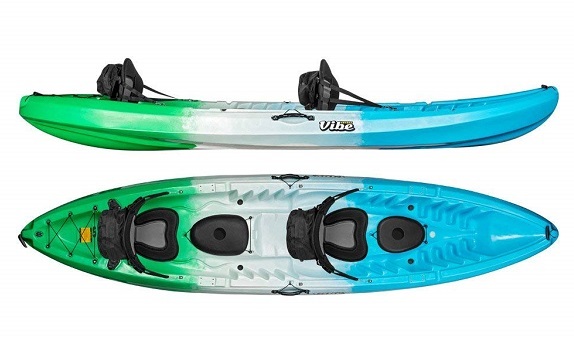 If you are a beginner but you are up for a comfortable Kayak ride then you can reliably settle on Vibe Kayak’s Skipjack 120T. The 6 rod holders including 2 flush mount holders (with caps) and 4 mounting point rod holders can make you fishing life more remarkable than ever. It is also equipped with 4 carrying handles for uncomplicated transportation. This stable kayak can uphold 2 adult and one child in the 3 seats and can be solo paddled from the center position. Multiple storages are great for bearing accessories. It is equipped with 7 rod holders that include 4 flush mounting holders and 3 articulated fishing rod. Flush-mounted rod holders are great for multiple lines at once in the water and the adjustable holder can ensure the perfect angle for your compatibility. The secure cargo area and the two paddle rests guarantee your safety. Has a length of 12 ft. This 12-feet Malibu Tandem Sit-on-Top Ocean Kayak is a perfect deal if you are married and has one baby or pet. It has 2 comfort plus seats for supreme ease. You can go for 2 adults along with one child or one pet. The 3 seating positions are bow position, stern position and middle position. If you are super worried about weights then let us ensure you that the weight lifting capacity of this Kayak is around 375-425 pounds, so breathe out the stress about weight and have fun with your kayak voyage! The paddler in the center can paddle solo if he wants. 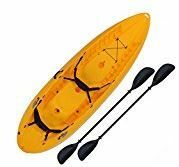 This kayak has molded-in handles, skid plate, molded-in seat walls, patented overlapping foot-wells and gear straps for an enjoyable adventure. This compact yet versatile Kayak has deck for easy loading. Has a length of 10 ft. 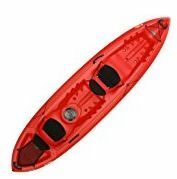 This Lifetime Kayak of 10 ft. is a wonderful kayak as it is made of high-density polyethylene for UC-protection. Three people (2 adults and one child) can easily seat on the kayak as it has multiple foot-rests for ultimate comfort. Has 6’ storage for storing your accessories. Having 500 pounds weight lifting ability, it has 2 double-sided kayak paddles for uncomplicated paddling. In companied with the 3 fishing pole for enjoyable adventure, the 2-padded backrest take care of your health and body. Has a length of 13.5 ft. If you want best tandem Kayak that has enough space for comfortable seating then undoubtedly this Sun Dolphin Bali kayak is going to be your favorite. This is because it has a length of 13.5 ft. which is absolutely perfect for 3 persons. You can go for solo ride or you can settle on 2 or 3 persons if you want to. The seats are adjustable and have comfortable backrests. This kayak can lift around 600 pounds weights and is equipped with paddle holders and carrying handles. There are 3 cargo space compartments for bearing your needed stuff with you easily. This 70 pound weighed Kayak is completely lightweight and portable. 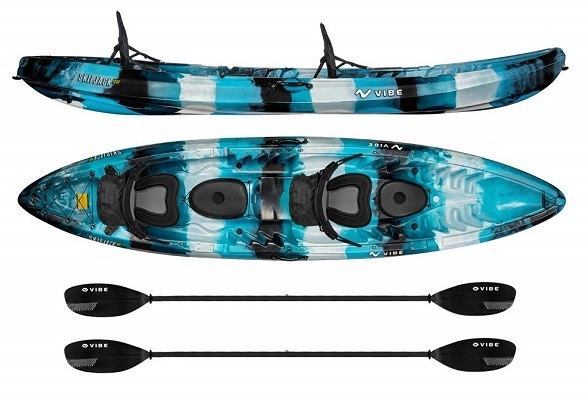 This Lifetime Kayak can be a perfect combo of ease and exploration id you can ride it well! This 10 ft. Kayak can go for solo or tandem ride but it also fits in up to 3 persons. This is because of its 500 pounds high weight lifting capacity. This includes 2 double sided paddles and a forward cargo for easy transport. This lightweight Kayak of 60 pounds is portable and easy to bear. The rear of this Kayak can carry the handles easily. The 2 soft backrests make you journey comfortable. If you want to take you Kayaking experience to the next level, Lifetime Beacon Tandem Kayak is all you need! This 12 ft. The 4 carrying handles make your transportation easy and for all you accessory, you get storage hatch. The skeg wheels and cargo lacing system ensures the quality of this Kayak. 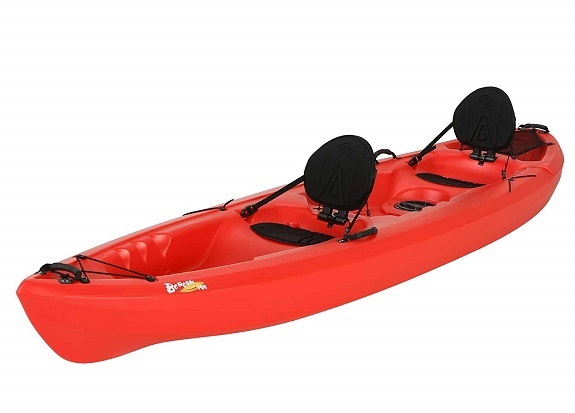 To enjoy your Kayak ride, you can try this Lifetime Beacon Tandem RED Kayak. You can go for solo ride or you can also take your friend! This tandem Kayak can hold up to 2 persons and has the ability of lift up to 500 pounds weight. It has foot braces for security and molded-in footwells for utmost comfort. This kayak has skeg wheels and ultra-lite seating facility for adventurous ride. Along with the storage hatch, the High density UV-protected Polyethylene is guarantees the quality of the Kayak brand. If you are adventure-freak then Vibe Kayaks Skipjack 120T Kayak is something that will never let you down. 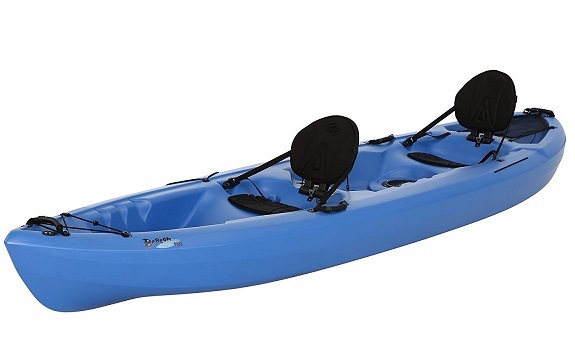 This 12 ft. Kayak can hold up to 500 pounds wùeight along with 2-3 persons. It has 2 padded seating facility and 2 paddles for easy surfing. 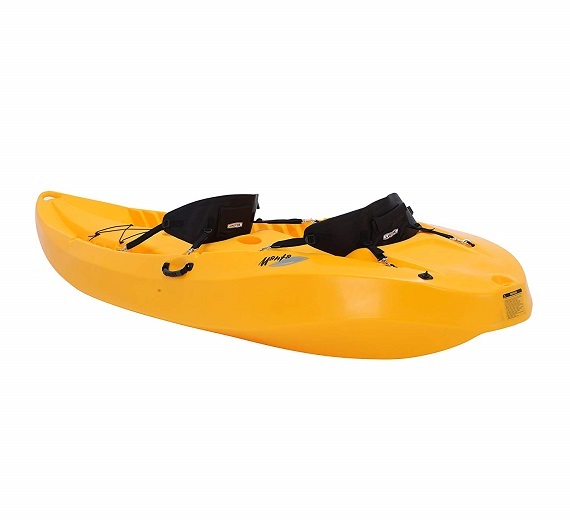 For storing during adventure, this kayak provides 2 sealed hatches and a rear cargo space. Before purchasing any Tandem Kayak, know your own height and your partner’s height. 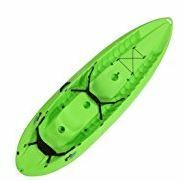 Of you are too much tall then you can to purchase a high seated Best Tandem Kayak and if you are short then go for a lower seated Kayak otherwise you will face difficulties while paddling. The other thing you have to keep in mind is how much area or space do you guys cover. If you are a little healthy then you have to go for Kayaks that have bigger space or length. The weight of you and your partner is also a fact. Different Kayaks have different capacity to lift weight, discover that. 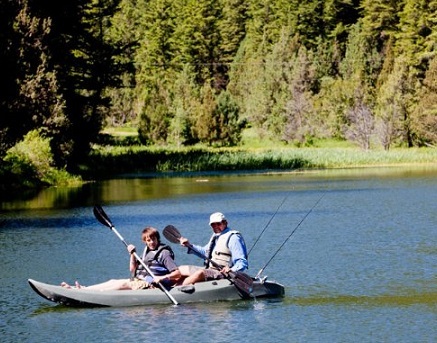 Then you should know if you are going to do Kayaking gently for cruising or fishing. If you are going to need a larger storage then you have to make sure that the Kayak you selected has storage hatch and cargo space. If you are a beginner then go for a Kayak that is easy to paddle and operate. If you are experienced in Kayaking then go for any of your choice. What is Tandem Kayak Storage? If you do not have enough storage then you may find your adventure hard. Most of the Tandem Kayaks include storage hatch for carrying goods along with rear cargo space for carrying the paddles. Who paddles a Tandem Kayak? In this case, you have to identify the more experienced Kayaker. It is better if the experienced Kayaker sits in the rear seat of the Kayak. The reason of this is the person who is in the back will be the person who will steer the Kayak and so the rear Kayaker can direct easily from the back. If you are in a calm condition, then it will be a great initiative to place the newbie in the back so that he can increase their experience along with confidence. Can Tandem Kayak be ridden solo? A Tandem Kayak can be ridden solo. Most of the Tandem Kayak has 2 paddles in the center seat. And some of the Kayaks have the paddles in the back seat. No matter wherever the paddles are, you can ride your Tandem Kayak by yourself sitting there. How much does a Tandem Kayak weigh? Tandem Kayaks are usually made for two persons (sometimes a child or a pet can be added.) These Kayaks can uphold 450 lbs. to around 600 lbs. weight. Most of the Kayaks in the market weigh between 60 lbs. to 80 lbs. Can all Tandem Kayak bear Child? As we have said before, Tandems are for couples, many of these Kayaks can bear 2 persons along with one small child or pet. Some of these Kayaks have a small seat for babies or pets. The weight lifting capacity plays a vital role because the more weight it can lift, the more weight you can put. It is better not to ride Kayak with 3 adults. Tandem Kayaks are to share your Kayaking experience with your beloved ones and paddling with a partner is never less fun! If you are up for making your life a little exploratory, pick any Best Tandem Kayaks from the subsequent list and get on it! Even moon has a dark side, so has these Kayaks. According to your preference, settle on any one. What are you waiting for? You get only one life, so never say “NEVER” and jump for what take you to bliss. Thanks for reading!